TopNotch is a digital agency which utilizes growth hacking for businesses, small and big, by amplifying their digital footprint in the latest design and development trends. Based in Cape Cod and Boston in Massachusetts, we create a wide range of digital products including websites, mobile apps, software, plugins, etc. For us, making your business optimized for the electronic age is top priority! From web design to web development, from UX design to UI design, from digital marketing to branding - we do it all! We assist you in transitioning your business into the digital landscape keeping in mind the latest trends and best practices. We provide you with profitable web design solutions for your physical business. Our designs are in line with latest trends ensuring a seamless user interface and experience. We offer web development in topnotch quality using a series of industry-recommended languages, and technologies such as WordPress, Joomla, Magento, OpenCart, etc. We deliver iOS/Android mobile app solutions for your business so you can easily handle your clients, resolve their issues, answer their queries and do business on the go. We fulfill the expectations of your website/app visitors by creating an exceptional user experience which is responsive and compatible across all platforms and devices. We create custom WordPress, Magento, OpenCart and Shopify plugins. These enable you to efficiently carry out your business operations while ensuring client satisfaction. We make tailormade software solutions including CRMs, custom software development, custom plugin development, and much more to increase your business revenue and ROI. We build cloud applications for various businesses and industries to make sure that they have the convenience of accessibility to their data and clients wherever they may be. We build custom database solutions for you to better suit the needs and requirements of your business model. We ensure that you undertake all business matters seamlessly. 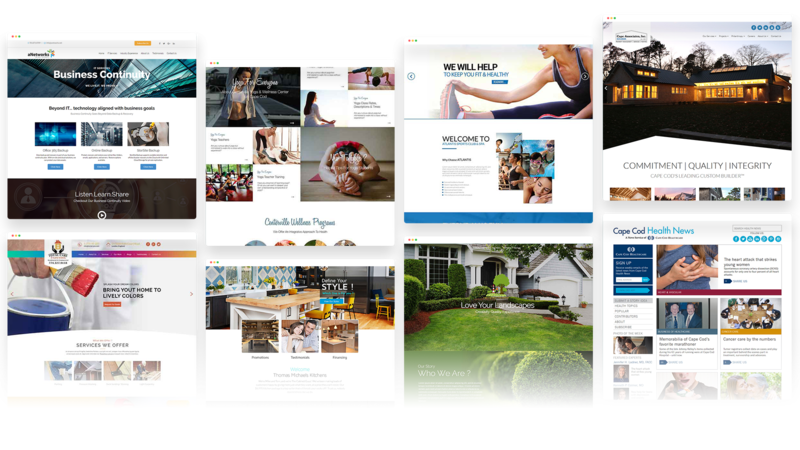 With website design and development for home improvement businesses to the healthcare sector, and from lifestyle companies to the corporate industry - here is a preview of our selected work. Our team of dedicated professionals, from expert developers to creative designers, knows how to go the extra mile for you. We conduct a thorough market research for your business, then strategize a plan of action accordingly, and finally execute it with perfection. Our list of happy clients includes family-owned businesses, picturesque holiday inns, nationwide corporates, local produce farms, and so many others. Here's what they have to say about us. TopNotch Innovative Technology in Cape Cod, MA provided us with mobile application development services and we could not have been happier with the results! We must specifically acknowledge the uniqueness and amount of effort they put into their work. From start to finish, Ali and his team were attentive, took the time to explain the development process and empowered us to make creative decisions that best reflected our brand – the entire team was very helpful through all stages of the project. The mobile app works smoothly, no hanging and it is flexible to automatic updating with 3D app designs. It is not prone to breakdown and the application is state-of-the-art in itself. It really is a beautiful final product and we have recieved so many compliments on the mobile app, thanks to the great work of the TNIT team! First class work! Very talented and responsive team. I highly recommend Top Notch Innovative Technologies. TopNotch Innovative Technologies, did our complete website makeover. We got the services of Cape Cod web design and website development from these people. And they have been amazing. Our responsive website design is totally user friendly and the fast website page load speed is just marvelous. They are very professional and we would like to recommend them in Cape Cod, Boston. We have the pulse on everything happening in the digital world, from movers and shakers to cutting-edge technologies; we write about any and all things that affect our business, clients, and their businesses and clients.